Some of you may recognize this brand. 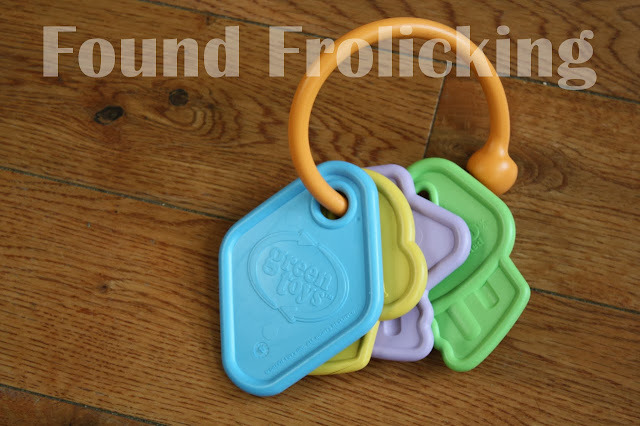 It might be from seeing it somewhere on the internet, hearing about it from a friend, seeing one of their products in person, or even from our very own review of the Green Toys Shape Sorter (which you can read by clicking here)! 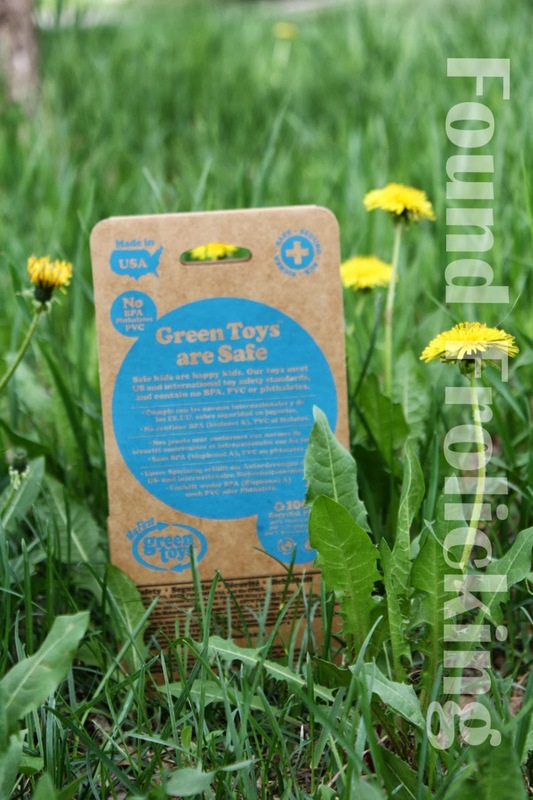 If you read our previous Green Toys review, you will probably recall that Green Toys uses 100% recycled plastic for making their various childrens' products, such as the Tractor, Dump Truck, and the Ferry Boat with Mini Cars. They are all proudly made in the USA! Since discovering the brand ourselves, our household has become big fans of Green Toys. We have the Green Toys School Bus, Recycling Truck, Shape Sorter, and the First Keys. I received the Green Toys First Keys for review. The First Keys comprises of three keys of different shapes and colors, and a "keychain" hanging from a large round plastic ring. The First Keys are safe for baby to play with from the day they are born, as they are lightweight, and there are no sharp parts for baby to hurt themselves with. 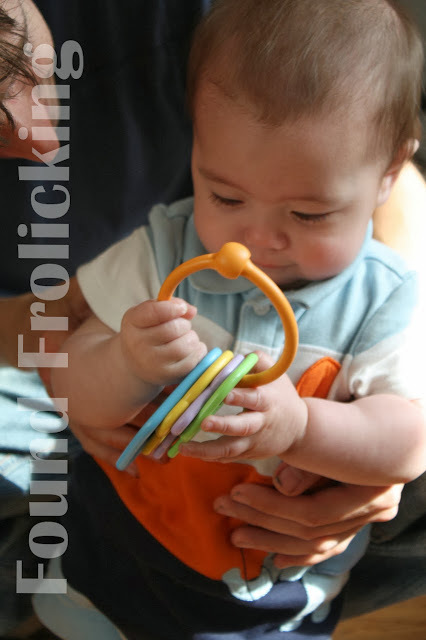 The sturdiness of the plastic and the texture also make this toy great for teething! And unlike with some other products, you won't have to worry about your little one coming into contact with icky chemicals with this toy! The First Keys are free of BPAs, phthalates, and PVC --- they even meet the FDA food contact standards. You can rest easy knowing that this toy (as with everything else from the Green Toys line) are safe for baby, made with the environment in mind, and are made locally. As soon as I took them out of the packaging, Baby E went right for them. He sat on the floor for more than 5 minutes, shaking and swinging them, making quite a racket! He was fascinated by the fact that he was able to produce noise. Every time he heard the clinking of the plastic, he would get excited and shake it again to reproduce the sound. As with many of his toys, he mystically makes them vanish for random amounts of time (translation: loses them), and whenever he discovered the First Keys again, they mesmerized him! I've mentioned before that Baby E isn't always the most agreeable little guy when it comes to car rides. One of my tactics for helping him enjoy car rides to have car toys. When I say "car toys" I don't mean toys that are cars, rather toys that live in the car, to be played with only during car rides. The First Keys has become one of those toys. I will sometimes dangle them from another toy attached to the handle above the window near his car seat, and other times handle it to him as I can tell he's decided he's had enough of his car seat. It has become one of his favorite toys, since he loves the sound they make. Another thing to love? They're also affordable! The Green Toys First Keys can be purchased for $7.99 direction from their website, by clicking here. You can also make sure that you receive news and updates on promotions and new products by following Green Toys on their social media platforms. You can find Green Toys on their Facebook page, and follow them on their Pinterest page, and Twitter account. You also have a chance to win a set of the First Keys by Green Toys! 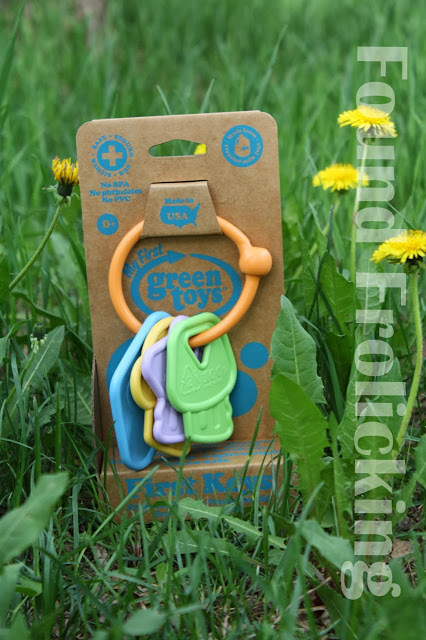 Green Toys has kindly offered to give the First Keys toy to one lucky reader! Open to the US & Canada. Please read the fine print before entering, and then enter below using the Giveaway Tools form. Good luck! The First Keys have lots of bright colors that baby loves! I love the tractor! so cute! I always love a chance to win Green Toys! They are our favorite kids toys. I personally am very fond of their super durable and cute Green Eats! My my daughter is a year now and I have yet to buy her her own Green Toy, I need to remedy that. Thanks for the chance to win the keys though, the one I've been eyeing for her for a while now. I never thought to buy green toys but these are really cute. I like the My First Green Toys™ Shape Sorter.